Hello, i'm having a slight issue with collisions between my character and a physics actor. I have a ball that uses a sphere component for its physics and collision and i have a character. What i want is that the player and the ball don't bounce on each other but do overlap. Problem is, when a ball slowly rolls and the character walks over it sometimes the character gets launched away. It looks like the character bounces into the direction the ball is rolling. But all of the components have Overlap instead of block, so why is the character being moved on collision? The following are screenshots of the two actors' collision properties, take note that all of the other components have no collision enabled. Does any one have a clue? Well, i removed all left/right/forward/backward input actions and tried again, no problem, then i did something that caused the editor to crash. Started the project up again, added the input actions back, no more buggy behavior... Guess this is fixed then! Glad this got resolved... I was just trying to reproduce it without any luck. Still, that's a bizarre problem and I don't know what caused it. If you see this happen again, please reopen this post. Thanks! Well, it's fixed for the Fire event, it now triggers the InputActionForward (W key). I just changed my MoveForward Axis Mapping to another key, and now it doesn't happen again. Changing it back to the W key makes it go wonky again. It looks like you have the W key set to two different mappings; your Axis Mappings has W set MoveForward, and your Action Mappings has W set to Forward. What are you using Forward for, and is there a reason you have W set to both? Forward is for dodging forward, checking if the player has pressed the key twice in rapid succession, while MoveForward is checking if the player holds the key for walking. You're confusing the blueprint by having the same key mapped to two different inputs. You probably want to do your check for holding the key down vs double-tapping it using the same input node. I'm going to reproduce what you have here and see if it causes the same problems you've been experiencing, but either way you should probably make sure you don't have the same keys mapped to multiple inputs. Hmm, that could be it. 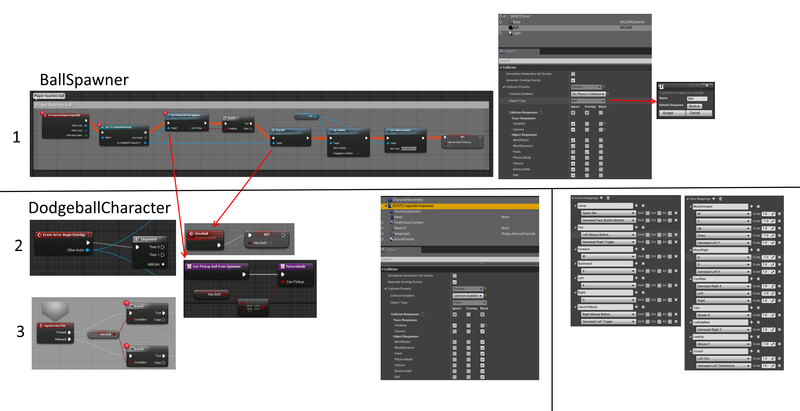 The last hour or so i tried to trace why the InputActionFire Released node gets stuck in an infinite loop (after which the game crashes) when i touch the ball. Removed those Forward/Backward/Left/Right input action nodes and now it doesn't do that anymore. However, it now triggers the InputActionFire Pressed node twice in a row. The fire action is mapped to the left mouse button and nothing else, so it should't be confused about that. So you don't have the left mouse button mapped to anything other than Fire, correct? I'm guessing your CatchOrBlock uses a different input, right? Would you mind letting me see what your Fire action looks like in your Blueprint? Thanks! That is correct, CatchOrBlock uses the right mouse button. Hm, I don't see anything that should cause that. I might need to build this on my end to see if I get the same thing. In the meantime, try closing and reopening the editor just in case the Action Mappings changing so much isn't causing weird behavior. And just to be sure: the original question you asked involved strange collision behavior. Has that been resolved, or is that still happening? The problem you're having now is only the double-fire? Well, technically it's the same, except in that case the dodge action event (left/right/forward/backwards) got fired instead of the fire action. I'll try restarting the editor again. Restarted the editor, same thing happens, two fire events when touching the ballspawner's ball. I guess i could give you the project if that could help. Hm, I have a setup like yours now and I'm not getting a double-fire. If you step through your Fire process, what happens when you reach the SpawnActor node? Can you see a delay between the two balls being fired? You just said it happens when you're touching the ballspawner's ball... does this mean you need to be standing on that Actor when it happens? If you feel comfortable zipping your project and putting it up somewhere where I can get to it, I will try again with your project tomorrow morning. Otherwise I'll keep trying to reproduce it with my project. EDIT: are you in 4.2 now, or is your project still 4.1.1? If in 4.2, was it converted from a 4.1.1 project? When you reopen your project, is your Ball Object Type still in your Project Settings? It happens when i overlap the ballspawner's ball, this is just a static mesh, not the actual ball that has physics for rolling etc. The fire event gets fired before any SpawnActor node gets fired (because the SpawnActor node is behind the fire node), but this isn't set in stone, when i just remove or add random nodes, sometimes it's fixed, sometimes it just moves to another action event. I've upgraded from 4.1.1 to 4.2 and the ball object type still is in the project settings. I will post a link to the zipped project whenever you're ready. I don't want the link to be visible for too long. I'll be in the office for another 6 hours or so today. I should get an email as soon as you post it here, and I'll let you know as soon as I have it. Thanks! Simply walk over the ballspawner and see the Fire action event be triggered and a second later another time which actually launches the ball. Okay, great, got it. I'll let you know after I've had some time to look around in it. I haven't had a lot of time yet, but I am seeing some strange behavior in this project. Before I go any further, can you tell me whether this is a purely Blueprint driven project or if you've added any custom c++ to it? Also if you've altered source in any way? This is pure blueprints based on a blank empty project with starter content. There has been no alterations to the source or any c++ code. On a hunch, I removed all the dodge input nodes, the MoveForward and MoveRight nodes, and the Fire node from the Character's EventGraph. I then went to Project Settings > Input and deleted each of those Inputs. I recreated them, and used them each in the EventGraph. Works perfectly now, as far as I can see. It doesn't even have a problem with the WASD keys being mapped to multiple inputs. Give that a try. It's possible it's just remembering things it shouldn't. Let me know if the problem pops back up again. Hopefully it won't! Oh wow, this is one of the weirdest things ever. Apparently the InputActionLeft event (bound to 'A') on my blueprint gets called when the ball touches the character. Take a look at the screenshot: i am pressing no keys, but the event still triggers. When i remove the InputActionLeft event it fires the InputActionRight, removing that one fires the backwards variant, and removing that one fires the forwards variant. Finally when i remove that one everything behaves as normal. about collision sweep , is unreal bug? Why does my terrain have collision issues?